West Lafayette, Ind. — Don’t let the name mislead you: Purdue Road School isn’t just about roads. Originally a conference for county surveyors and city engineers, the 105th Purdue Road School has evolved from road and street issues to an event that covers the latest in all areas of transportation, including drones, e-scooters and other issues. The event begins Monday (March 4) with afternoon sessions and continues until March 7 with meetings and sessions at Purdue Memorial Union and Stewart Center. For the Purdue Road School’s Wednesday luncheon, President Mitch Daniels will conduct a fireside chat-style talk with keynote speaker Jim Hackett, president and chief executive officer of Ford Motor Co.
Six speakers are scheduled for Tuesday’s opening session, including Brandye Hendrickson, deputy administrator of the Federal Highway Administration, and Joe McGuinness, Indiana Department of Transportation commissioner. 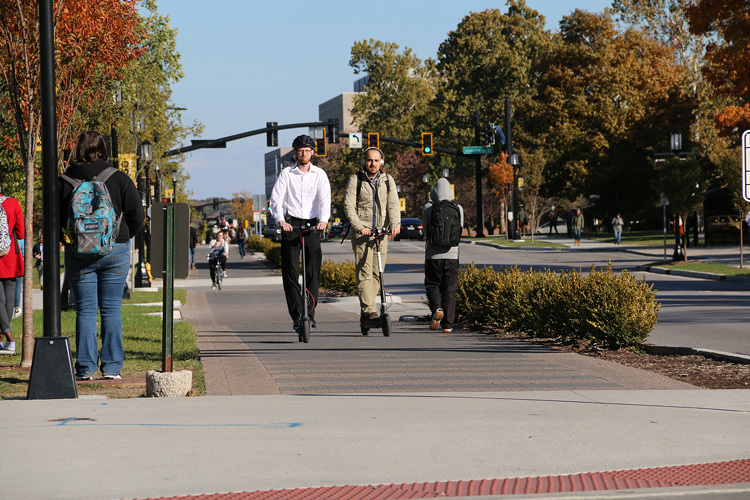 Darcy Bullock, a civil engineering professor and director of the university’s Joint Transportation Research Program (JTRP), said the Purdue Road School planning committee works each year to identify the most timely topics. This year is no different. He said another session will discuss e-scooter usage trends and how agencies are responding to this new transportation mode. E-scooter users travelled over 475,000 miles in Indianapolis in just 3 months this past fall. New this year is Purdue Road School’s collaboration with The Work Truck Show held at the Indianapolis Convention Center. Registered Road School attendees may participate in technical sessions and visit The Work Truck Show Exhibit Hall on March 7. This year’s Road School includes more than 190 presentations involving almost 350 speakers and moderators. In addition, more than 50 exhibitors will be set up in the North and South Ballrooms of the Purdue Memorial Union on the first full day of the event. Purdue Road School traces its origin to 1913, when W.K. Hatt, head of Purdue’s School of Civil Engineering, initiated a conference to help county surveyors and city engineers develop and maintain Indiana’s roads and streets. At the 1914 conference, a resolution was passed calling for a yearly school for county road superintendents. In 1915 the conference officially became known as Purdue Road School. The 104th Purdue Road School Transportation Conference and Expo was the largest Road School on record at 3,010 attendees. Attendance is expected to exceed 3,000 people this year. More information and registration is available at https://roadschool.purdue.edu.